I’m not advocating for deviled eggs as a health food, but they are surprisingly less bad for you than I thought. 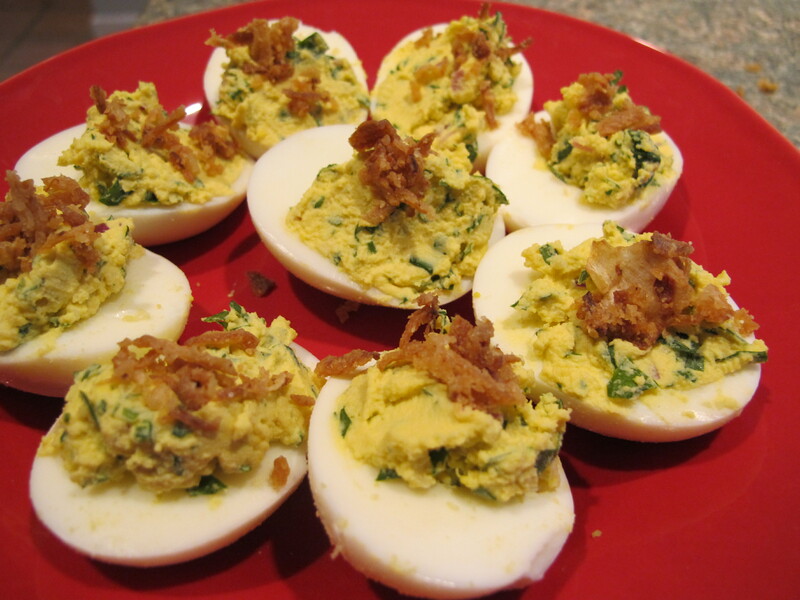 This recipe makes them only slightly worse for you than just eating a hard-boiled egg. And while the jury is still out on eggs are good for you vs. eggs are bad for you, I think a little extra protein in moderation is ok. So just don’t eat too many of these. To hard boil the eggs: Put eggs in a covered pot with cold, salted water, eggs should be covered with water by at least 1/2 inch. Bring eggs to a boil and then remove covered pot from heat, leaving eggs in hot water for 15 minutes. Pour cold water over eggs and remove from pan. Peel – tap eggs lightly on their side and peel until you can get the thin membrane away from the egg, this will make it much easier to peel. Slice lengthwise and put yolks into a bowl, carefully reserving the whites to be filled later. Combine yolks, mayo, garlic, onion, lemon juice, parsley, mustard, and milk in a bowl with a fork until it forms a paste. This is the filling to your eggs, spoon back into the whites. These are best when refrigerated overnight but can be served immediately. These are also best with a slight chill, so if you are making a day ahead take out of the fridge just before guests arrive. I topped these with fried onion straws, you can top with parsley, chopped bacon, paprika, chopped olives, etc.